Edesix, a market leader in the provision of body worn camera solutions, has launched new head and torso mounted cameras. 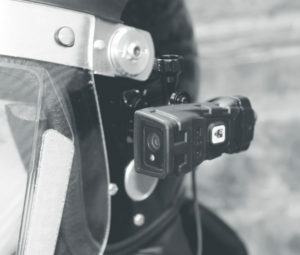 The X-100 is a side-mountable tactical head camera, ideal for use on headwear as currently utilised by police firearms divisions. The X-100 offers automatic rotation of footage, meaning it can be worn on either side of the head without requiring user configuration to rotate footage. The X-200 is a torso-mountable camera for use on uniform vests, tactical body armour or all-weather clothing. Both are capable of capturing 1080p video at 30fps, or simultaneously recording and streaming at 720p. Both accessories are easy to operate and integrate into an existing evidence capture procedure. Recording is triggered by a toggle push-button and haptic, audible and visual alerts will leave the operator and the public aware of recording beginning and ending. Both are available with a choice of connectors for attachment to a wide range of mounting options. Both the X-100 and X-200 are accessories to be used along with the VideoBadge-300. They are plugged into a VB-300 with a convenient two-part cable for easy removal, which allows a VB-300 to be situated under a uniform or on a belt pocket. Edesix is a leading supplier of body worn camera solutions. Its all-encompassing solution, which includes the VideoBadge and VideoManager software, has proven to deter aggression and protect those working on the frontline, but also facilitates the creation of secure, tamperproof video and audio evidence when required.